DALLAS (AP) — Larry Brown can’t imagine that any coach is doing a better job this season than Tim Jankovich is with short-handed SMU. “Oh, it’s remarkable,” Brown said. While it has taken a while for most people to notice, the 17th-ranked Mustangs are doing quite well after the sudden and somewhat unexpected departure last summer of Brown, the Hall of Fame coach who two years ago took SMU to its first NCAA Tournament since 1993. He left after a contract dispute. 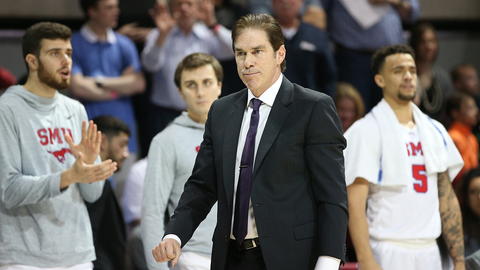 “Just a good group of guys and I think now that they’ve been through a lot, and they’ve been together through so much, it has really resulted in what you’re seeing on the court,” SMU athletic director Rick Hart said. The Mustangs (24-4), one of the nation’s top defensive teams allowing 59 points a game, went into this weekend with 20 wins in their 21 games since November and a share of the American Athletic Conference lead. With those key seniors and Brown gone, SMU is limited this season because of the NCAA penalties — down at times to only six available scholarship players. But those sanctions, related to a September 2015 ruling against Brown involving a case of academic fraud , won’t keep the Mustangs out of another NCAA Tournament. Jankovich was SMU’s associate head coach the past four seasons. He was also head coach-in-waiting, a title he didn’t particularly like, but a necessity to leave a head coaching job at Illinois State for a spot on Brown’s staff. Sophomore guard Shake Milton said Jankovich lets the Mustangs push the ball more and shoot more — especially 3-pointers, averaging seven more attempts a game than the past three seasons — but the coach demands the same kind of focus on defense and rebounding as Brown did. Milton, Foster, seniors Sterling Brown and Ben Moore, and former Duke transfer Semi Ojeleye all play more than 32 minutes per game as starters. Ben Emelogu, a transfer from Virginia Tech, averages more than 21 minutes and was the only sub used the past four games except for a walk-on senior being in for less than a minute just before halftime one game. Even though the Mustangs still have to give up a total of four more scholarships over the next two seasons, Jankovich feels great about the program’s future. There are six expected returning scholarship players, plus four recruits already signed for next season.